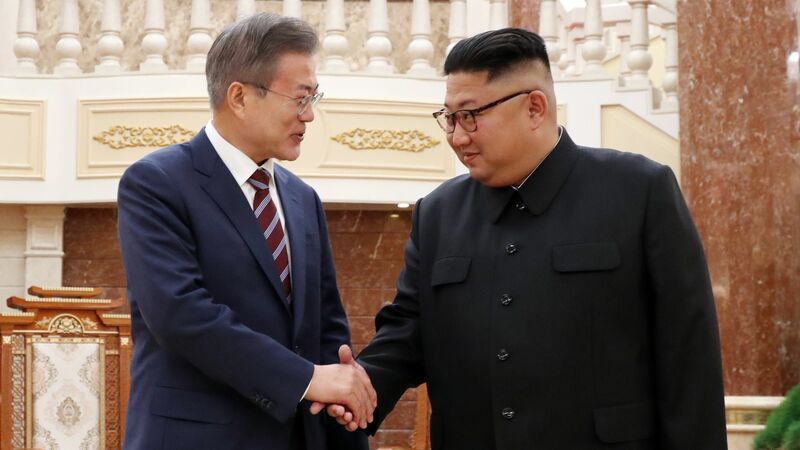 Following a meeting with the North Korean leader, South Korean President Moon Jae-in announced Kim Jong-un has agreed to "permanently dismantle his main nuclear complex at Nyongbyon if the United States takes corresponding measures," the AP reports. The details: President Moon declared at a joint news conference with Kim that "the era of no war has started," per CNN, "[t]oday the North and South decided to remove all threats from the entire Korean Peninsula." North Korea reportedly agreed to permanently close the Dongchang-ri engine testing and missile launching site, and destroy the Yongbyon nuclear site. The two countries also said they would seek to file a bid to jointly host the 2032 Summer Olympics. The big picture: Thus far, the regime has refused to provide documents of its nuclear weapons, stockpiles, and production sites — a matter the U.S. has required for continued cooperation. Although North Korea has made significant steps towards diplomacy with South Korea, and maintains a seemingly solid relationship with President Trump, this agreement falls short of the U.S.' requirement that North Korea achieves "complete and total denuclearization." President Trump responded in a series of tweets saying the developments are "very exciting."